The photographs in this accession were a part of a group of seventy-seven items donated by Florence Cook to the Tantramar Heritage Trust on 21 August 2006. 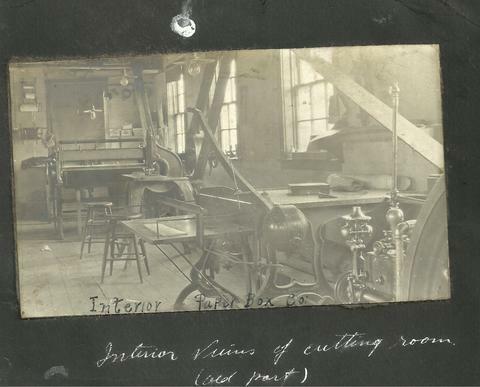 Item is a photograph of the interior view of the cutting room showing two cutting machines and a hand cutting machine in foreground. The top half of a photograph of a woman holding flowers is located on verso. Bottom half of picture is located on item 38d. Item appears to have been cut out from a scrap book which held pictures on both sides.